My first semester as a full-time teacher, my grandfather, the rocket scientist, came to the classroom and explained the concept of propulsion systems to a group of five- to eight-year-olds. It was a presentation he had polished by teaching generations: He had taught my grandmother’s fourth graders and my mom’s fifth graders, and on that Friday, he was going to meet a few of mine. Neither the students nor Grandpa quite knew what to expect when he entered the women’s center, the safehouse that provided refuge for these kids, their brothers and sisters, and their mothers. The students sat in a semicircle on the rug awaiting his arrival, swinging their feet against chair legs, their muddy tennis shoes hanging over a map of the world. As Grandpa sat down and held up an old poster of a space shuttle on launch day, they leaned forward to look at the mountainous billows of smoke and steam and power left behind. These students, little ones who had seen far too much in their short lifetimes, had never been exposed to anything like this. They were captivated. As Grandpa pulled out a brightly colored balloon and began to blow it up, the students watched, wide-eyed. As soon as it was completely filled with air, Grandpa winked at me and let it fly. After it fell behind the bookshelves, we began to hunt for higher ceilings. We took the kids outside, and I found my eighty-year-old grandfather kneeling on cold concrete, picking up a kindergartner’s feet and placing them on a launch pad. The students standing in line stared at the stomp rocket then looked to the clouds, focusing their eyes on the bluest of skies. They could suddenly see beyond the security cameras and concrete walls. Here was hope, soaring toward the heavens. Several months ago, I came across some of the artwork the students had done in response to my grandparents’ visit—several rainbow-colored solar systems, smiling astronauts in space suits, a sun that glowed in the dark. In August, a few days after I stopped by his house to show him those pictures, I received the phone call that my grandfather had gone to be with Jesus. This world had never really been his home. My grandfather had worked at NASA during the first moon walk, but over the years, he had come to see what a small step for man that was compared to the giant leap taken by the Son of God, who gave up the majesty of heaven to stand on earthly soil. My grandfather’s Hero did not place a stake in the sand and leave the planet alone, but laying down His life, He restored what sin had made a “magnificent desolation.” My grandfather never stopped thanking God for this redemption. The morning my grandparents visited the classroom, after we passed around snapshots of the solar system, a third grader paused to study a picture of earth, its perimeter fringed with the rich black of the galaxy. His hand shot into the air, and he asked, “If the sun is in space, why is it so dark there?” Years later, I feel the weight of that question. 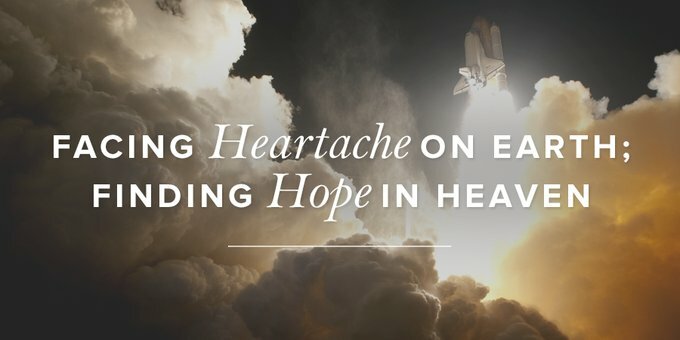 The impact of Jesus’ entrance on the atmosphere was immeasurable on every scale, and yet, the radiant eternal hope He provided has not removed the present heartache of death. When my health hit one of its lowest points, I lived in my grandparents’ guest room. Night after night after night, as I experienced excruciating physical pain, Grandpa knelt beside my bed, gray head bowed, humbling himself before the God of the universe. I did not know then that he was teaching me what I would need to do to endure the present darkness: to press my knees into the ground and put all of my hope in the Son. Before Genesis 3, before death and disappointment and domestic violence and division, before man’s disobedience caused the consequences of evil, God created the heavens and the earth. The world was good because He was good, and He did not change by the end of the third chapter. Those thin pages carry the framework of the ages. For as high as the heavens are above the earth, so great is his faithful love toward those who fear him . . . and his righteousness to children’s children to those who keep his covenant and remember to do his commandments. The LORD has established his throne in the heavens, and his kingdom rules over all (Ps. 103:11, 17–19). In times of deep pain or seasons that seem especially dark, where do you look for hope? Katie Laitkep is a hospital teacher, a seminary student, and a Lyme patient living in Texas, where God continuously sustains her through Scripture, dry shampoo, and Mexican food. She blogs her journey through medical treatment at www.apatientprocess.com with the hope that her words will be a picture of the Lord’s perfect faithfulness in chronic pain; for even in suffering, God is good.